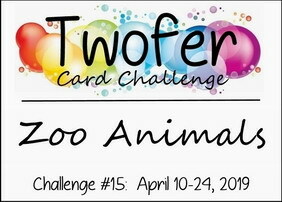 I am once again attempting to play along with Darnell's Twofer challenge - which this month is Zoo Animals! These instructions always throw me for a loop! 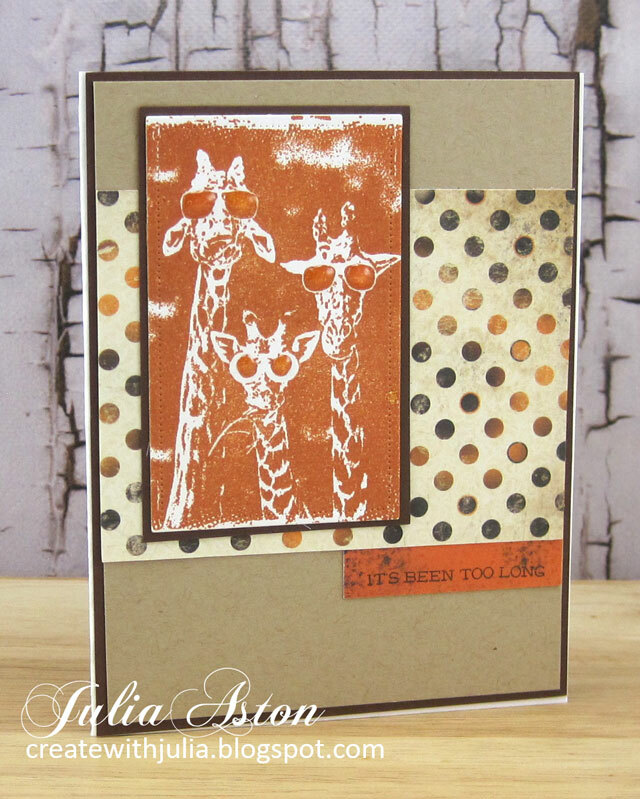 I used a really funny giraffe stamp from Technique Tuesday called Attitude Giraffes on both cards. I dropped Glossy Accents on the sunglasses (which you can't see too well here). The sentiment is from What's Up by Avery Elle. For my Twofer - I stamped the Attitude Giraffes on patterned paper and die cut it with a Circle Nestability and framed it in a Pinked Edge Nestability. I added Eerie Eyes from Doodlebug and brushed over all the giraffes with Clear Glitter Wink of Stella (not showing in photo!). The birthday sentiment is from Party Animal by Avery Elle. 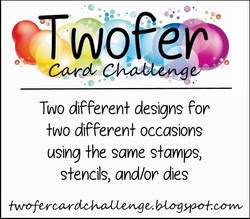 To be sure I made each card a different design, I enlisted the help of two sketch challenges! 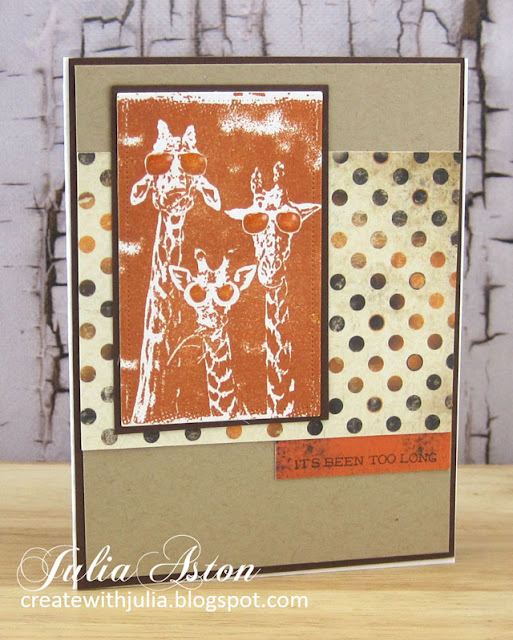 Stamps: Attitude Giraffes - Technique Junkies, What's Up - Avery Elle. Paper: White, Kraft, Dark Chocolate - PTI, DP Enchanted - Authentique. 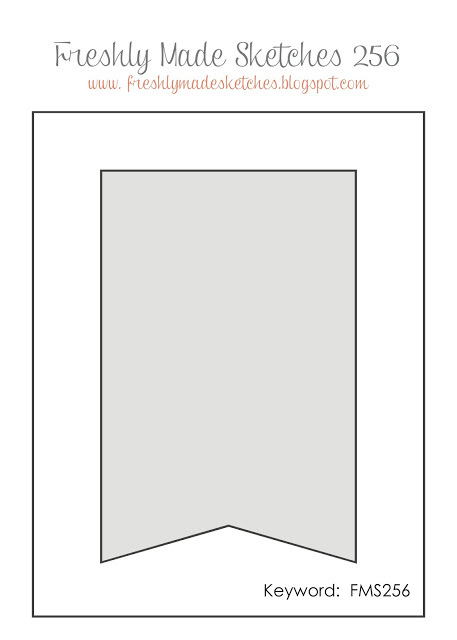 Accessories: Pierced Feature Frames: Rectangles - PTI, Glossy Accents. 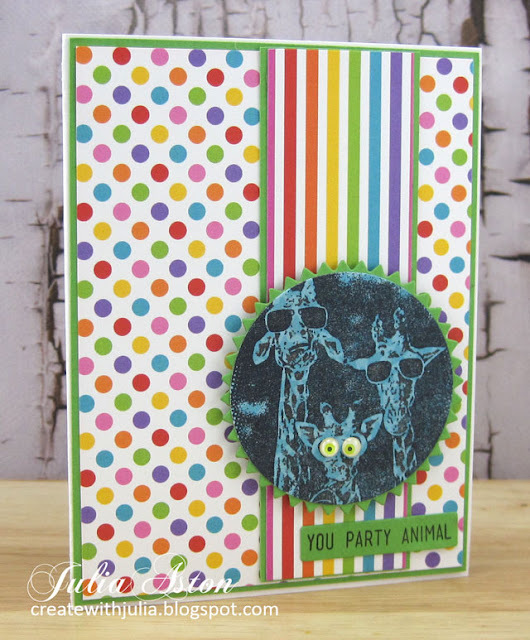 Stamps: Attitude Giraffes - Technique Tuesday, Party Animal - Avery Elle. 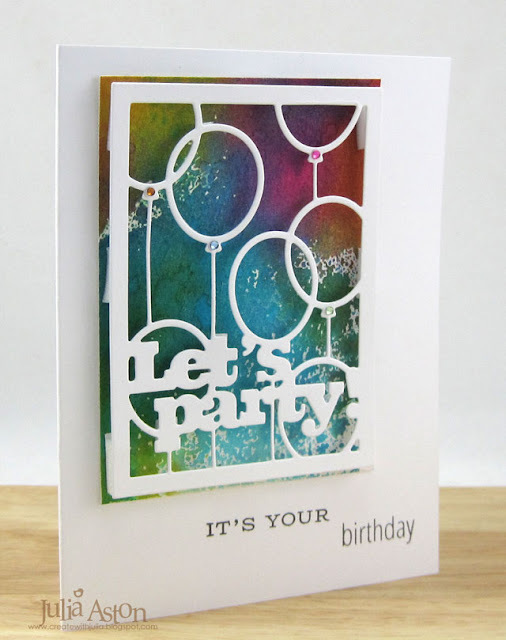 Paper: White, New Leaf - PTI, DP Rainbow Bright - Sunny Studio. Accessories: Nestability Circles and Pinked Circles, Clear Glitter Wink of Stella, Eerie Eyes - Doodlebug Designs. I'm charging forward in the quest to fill my Christmas card box for next year! 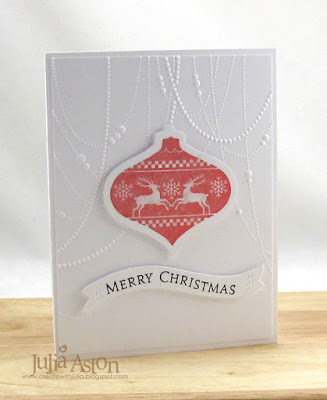 I've got 4 cards to share today using pretty much the same design but with some color and ornament stamp changes. The pretty ornament stamps are from the retired Waltzingmouse set - 2011 Holiday Ornaments. 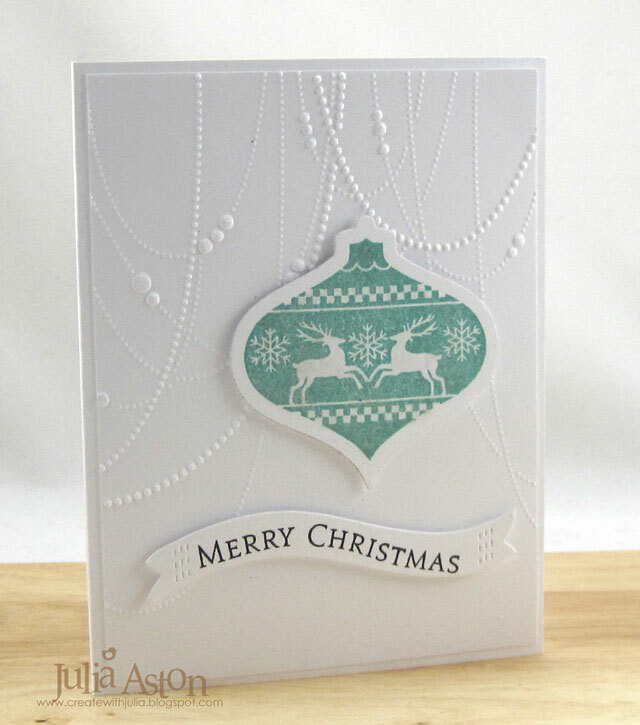 The ornament die is from 2011 Heirloom Ornaments Nestability set. 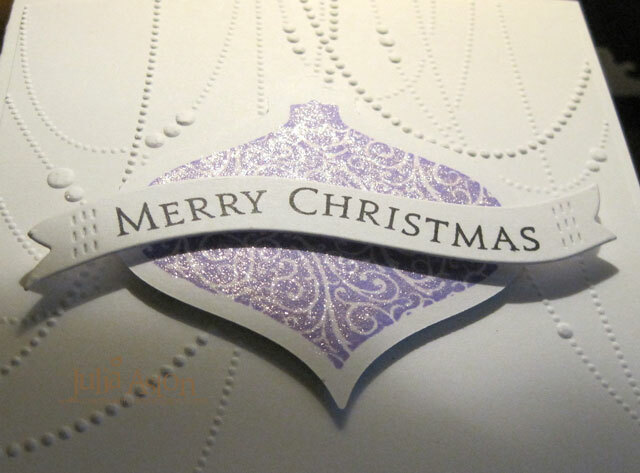 The Merry Christmas stamping on all of them is from Inside and Out Holiday by PTI. 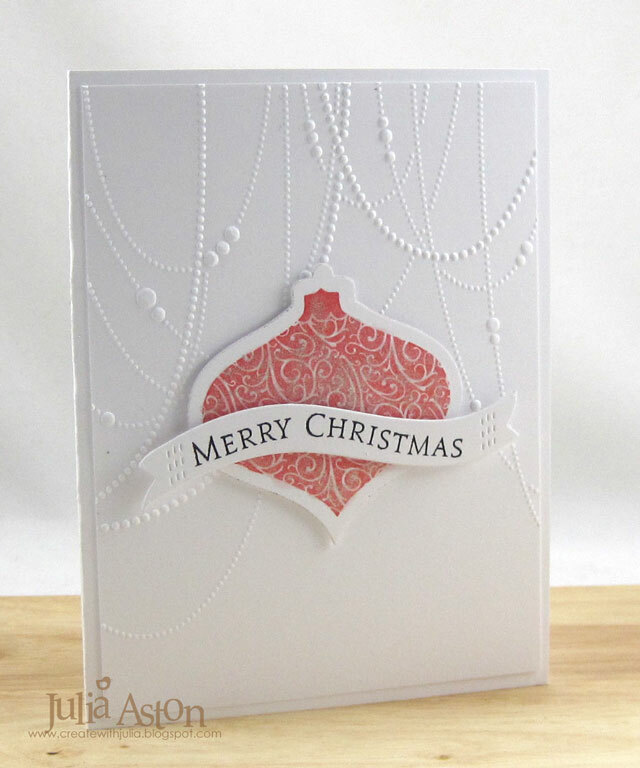 The embossing folder is Beaded Garland from Tim Holtz/Alterations/Sizzix, a new acquisition! I used Ranger Distress Inks in Wilted Violet, Barn Door, and Evergreen Bough on the ornaments. The sentiment strip is from Wonky Stitches Die set from Avery Elle. I brushed Clear Glitter Wink of Stella over all of the ornaments but it never shows up in photos! There is a lovely shine to them in the light - hopefully you can see it in the close ups below. 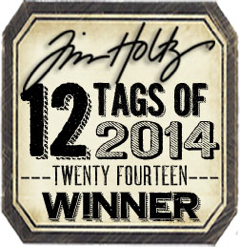 Stamps: 2011 Holiday Ornaments - Waltzingmouse (retired), Inside and Out Holiday - PTI. Ink: Her Arts Black, Ranger Distress Wilted Violet, Barn Door and Evergreen Bough. Accessories: 2011 Ornament Dies - Nestabilities, Wonky Stitches Die - Avery Elle, Beaded Garland Embossing Folder - Tim Holtz/Alterations/Sizzix, Clear Glitter Wink of Stella Brush, foam dots. 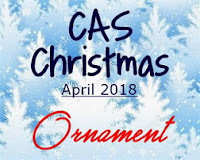 April CAS Mix Up Challenge - No Foolin'! Happy April 1st! 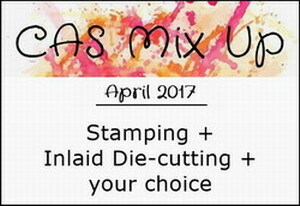 No April Fools jokes from me today - just happy that there's a new challenge up at The CAS Mix Up Blog! Bonnie is our hostess this month and here are the three things she would like us to use on our cards. 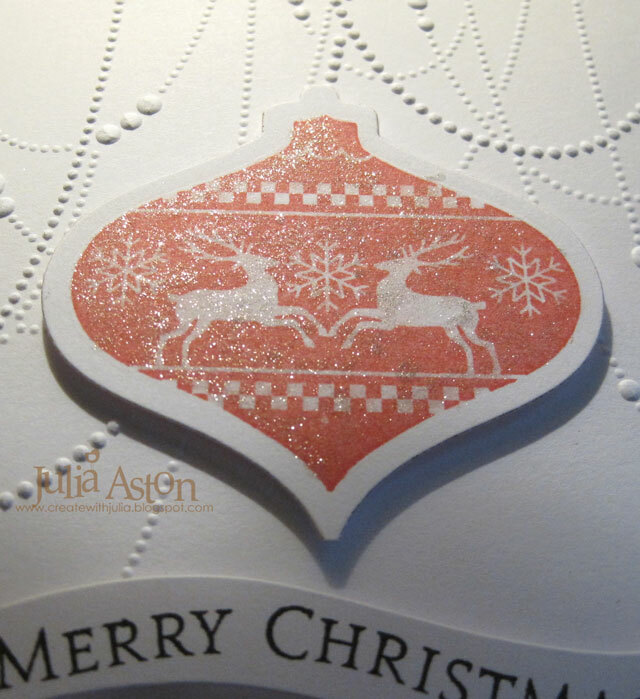 I used - 1) a sentiment stamp, 2) inlaid die cut eggs and sentiment, 3) my choice: a wonky edge die and sequins. I'm in the midst of making Easter Cards to sell at my church in a few weeks so that's what I made today. I used a Wonky Stitches Die (Avery Elle) to make the edge on a white card panel. I die cut the 3 eggs (Nested Eggs/Nestabilities) and the Easter (Waltzingmouse) out of the panel. At this point, I adhered the panel to my white card base. I die cut the Easter again out of green card and adhered it into the die cut space on the panel. 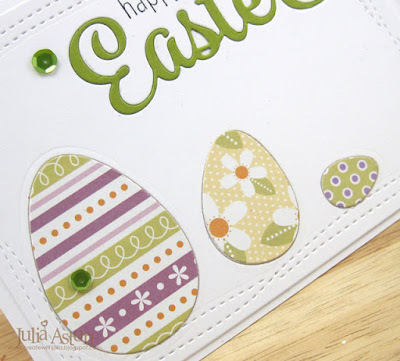 I cut the eggs out of patterned paper, and since the PP was thinner than the white card, I adhered the paper to the white card eggs I had cut, and adhered them into the spaces on the panel. 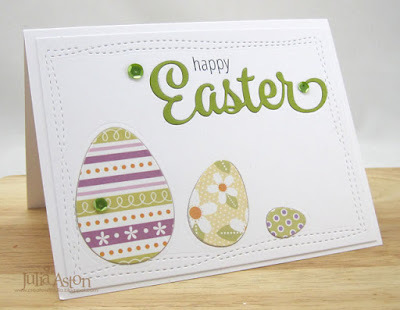 I stamped the happy over the Easter, added 3 green sequins and called it done! 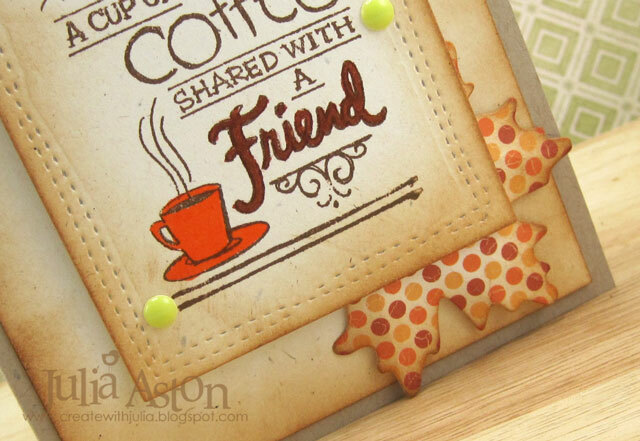 So please join us and show us how you use inlaid die cutting! 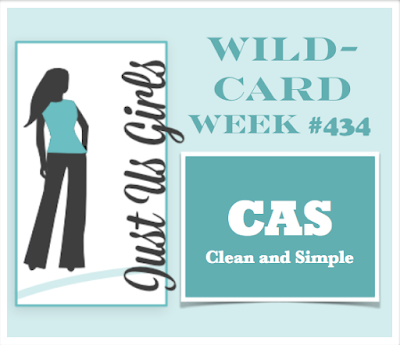 the CAS Mix Up challenge blog here. Accessories: Dies - Nested Eggs - Nestabilities, Easter - Waltzingmouse (retired), Wonky Stitches - Avery Elle, green sequins, Tombow Adhesive. 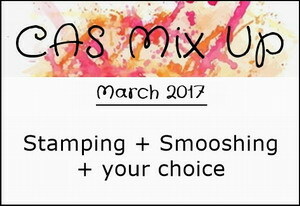 We are so excited to announce that March marks one full year of challenges at CAS Mix Up. 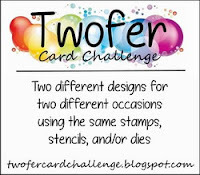 In celebration, we will be offering two prizes. The March CAS Mix up Challenge is up today! Loll is our host this month and here is her challenge for us. 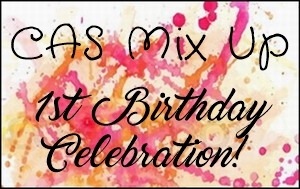 In celebration of CAS Mix Up one year 'birthday', I made a birthday card! I used sentiment stamps, smooshing using Ranger Distress Stains on watercolor , a block die cut, foam dots and tiny rhinestones! I sprayed Ranger Distress stains - Picked Raspberry, Fossilized Amber and Peacock Feathers onto my craft mat and then spritzed with water. Then I pressed a panel of Arches Watercolor paper into the colors twisting the paper a bit. The stains leave such wonderful vibrant color even when mixed with a little water. I added Tiny Twinkles to the base of 4 of the balloons for a little sparkle, matching the background colors! I cut the panel to be just a bit larger than my Text Block Party Time die and layered the die cut over the panel using slightly thicker foam dots to hold it up off the panel. 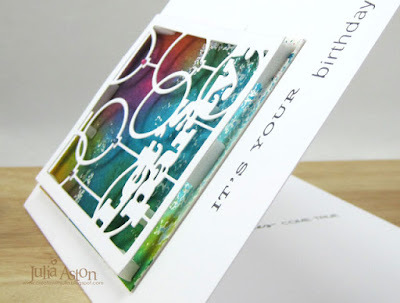 I used two sentiments - the It's Your is from Birthday Cheer by PTI and the birthday is from Simply Said Happy by Avery Elle. So please join us this month and show us YOUR smooshing creation! You'll find lots of inspiration from the Design Team as well as videos of smooshing with different products over at the March CAS Mix Up Challenge blog! and remember there are One Year Birthday prizes to be won this month! Accessories: Ranger Distress Spray Stains Picked Raspberry, Fossilized Amber and Peacock Feather, Die - Text Block Party Time - PTI, Tiny Twinkles - Taylored Expressions, foam tape. Yikes! where was I??? 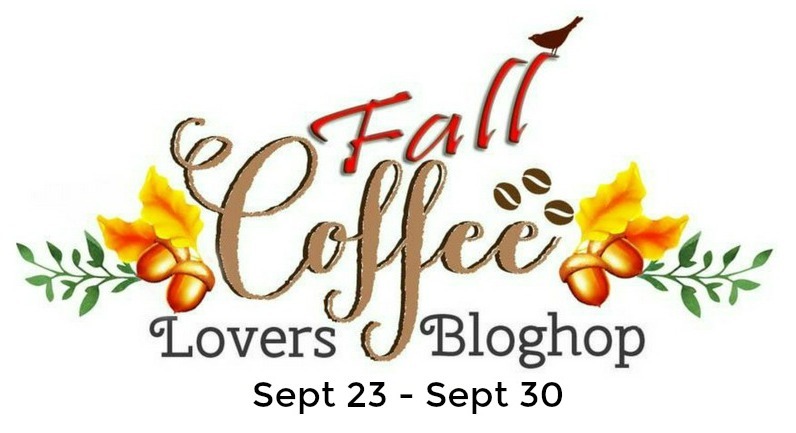 I almost missed the Fall Coffee Lovers Blog hop! But luckily saw it two days before it ends! I added two die cut leaves using dies from PTI - one out of Kraft Core Coredinations paper that I sanded to expose the kraft. I die cut the other leaf out of patterned paper from PTI. I colored the mug and FRIEND in fall colors of Zig Brush pens. I die cut the panel with a Wonky Stitched die from Avery Elle and popped it up over the leaves with foam dots. I sponged all the edges with Ranger Distress Vintage Photo ink. I'm off to the Coffee Lovers Blog to see the plethora of coffee/tea/cocoa cards linked up there! 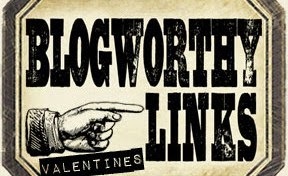 There are tons of prizes to be won - so get yours linked up too! Paper: Rustic Cream and Text Style Autumn Abundance - PTI, Kraft Core - Coredinations. Ink: Cocoa Bean - PTI, Vintage Photo Ranger Distress. Accessories: Leaf dies - PTI, Wonky Stitches dies - Avery Elle, foam dots, enamel dots - Michaels, Zig Clean Color Brush Pens. 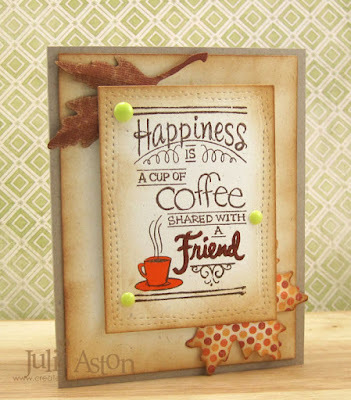 Hello friends - It's good to be back stamping - many of you know from my Face Book Page- that my dear sister, Marcia, passed away on April 26th, suddenly and unexpectedly after a fall. She was just 66 (her birthday was the day before she passed) and in good health - so it was quite a shock. I want to thank you for all of your kind thoughts and prayers during this difficult time for me. 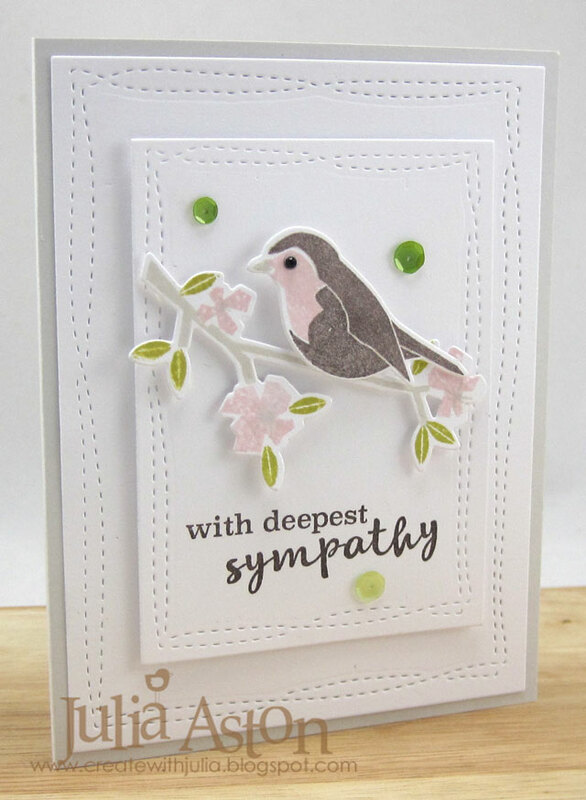 I received many beautiful sympathy cards from you and it has meant so much. 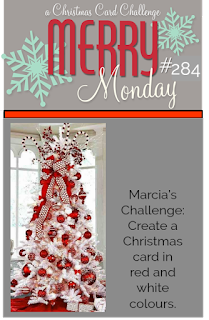 I have had a few posts here on the blog but they were all pre-posts - done before I lost Marcia. 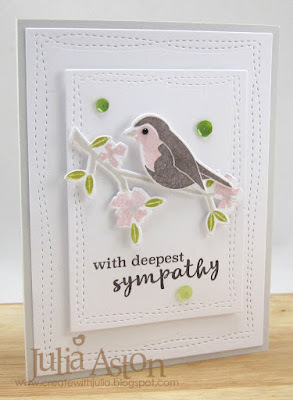 For the past two weeks I just haven't had the concentration or inspiration to create - but today I was finally able to make a card - and oddly enough - it became a sympathy card! 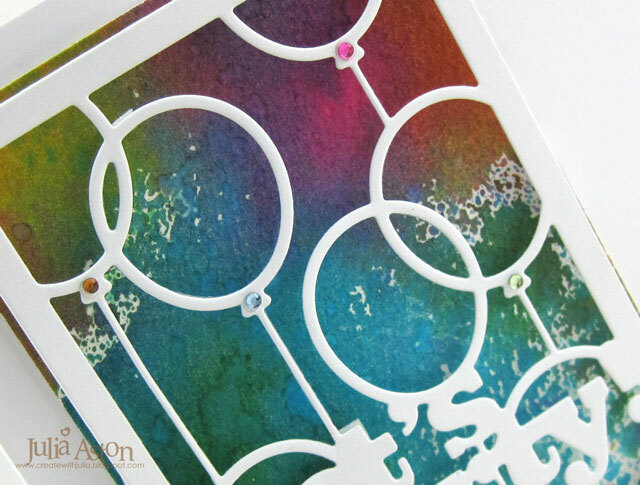 I made the card for the Inspiration Challenge over at Splitcoaststampers where we were to choose a color palette from a Pinterest page. I was inspired by this Puffin panel. 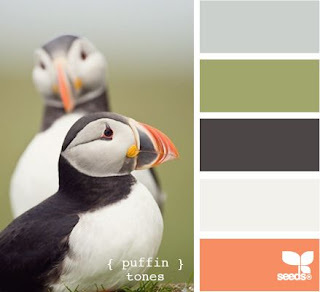 Three shades of gray, a green and a peachy/pink. 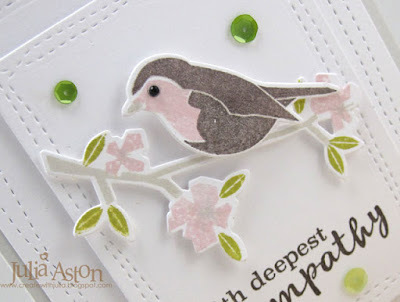 I used stamps from Spring Woods from PTI with the coordinating Dies. The panels are cut with Wonky Stitches dies from Avery Elle. This photo of my sister was taken at Easter this year - who would have thought she would be gone a few weeks later. Love you Marcia - and I'll miss you forever! 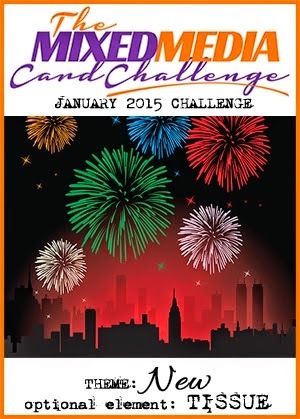 Here's my first card for 2015! I did a little shopping at Joann's and Michaels today - and one of my purchases was this cute Friends Cup stamp from Stampendous - I've seen it used on several blogs and love the viewpoint of looking down into the top of the cup from above. AND it was on sale 40% off AND I had an additional 15% off my entire purchase coupon! So instead of $9.99 it was around $4.50! I embossed the stamping with Copper Embossing powder and used Glitter Cardstock for the panels. 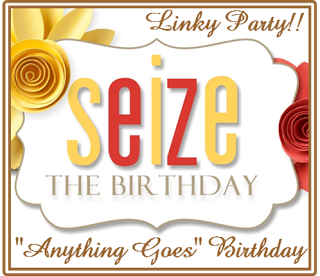 The Happy Birthday is from the Party Animal Set by Avery Elle. 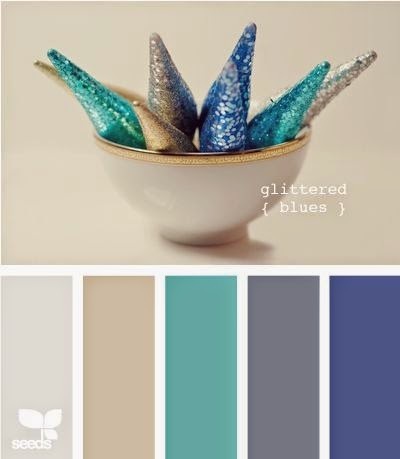 I added 3 Kraft Blend sequins - also from Avery Elle. 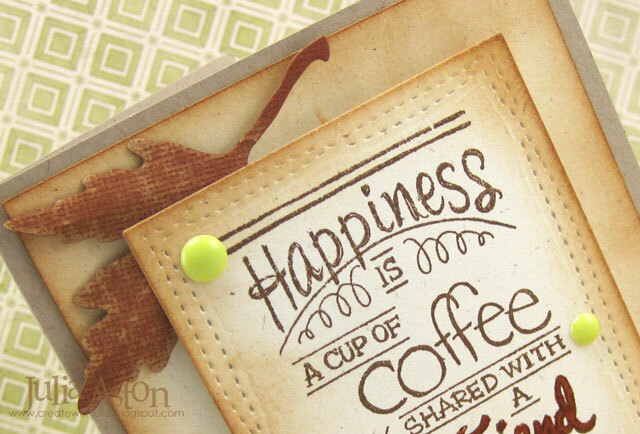 The coffee cup and sentiment are popped up on foam dots. And just a note: I always use ScorTape when sticking these glitter panels to each other since the glitter sometimes doesn't want to hold to lighter adhesive! This card is REALLY glittery IRL! Accessories: Copper Embossing Powder - Ranger, heat tool, ScorTape, foam dots, Circle Nestability, Kraft Blend Sequins - Avery Elle, Word Window Punch - SU. 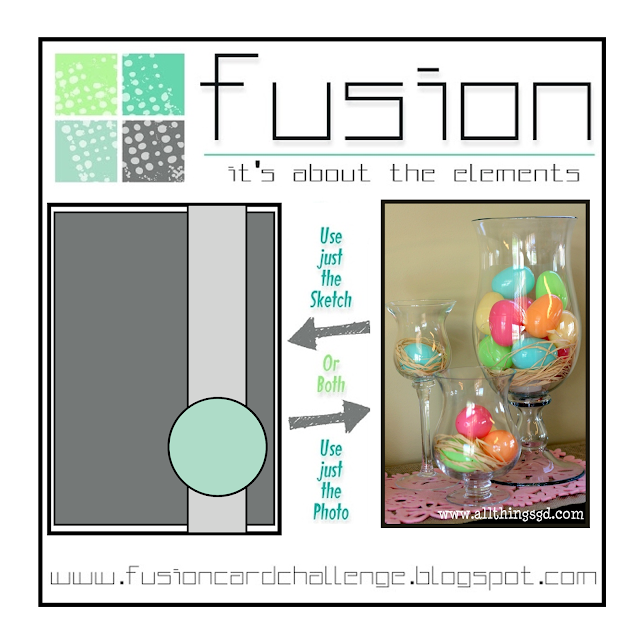 Fusion Challenge - One Year Anniversary Celebration! 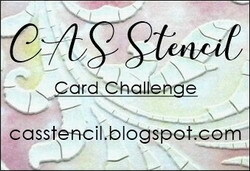 If you are looking for my Mixed Media Card Challenge post please click here. Fusion is one year old this month! And we are having a one Year Anniversary Celebration. 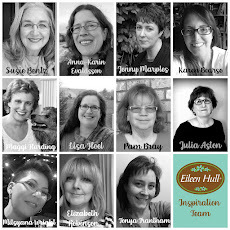 Each of the Design Team has invited a Guest Designer to join us for January - someone we admire and who inspires us. 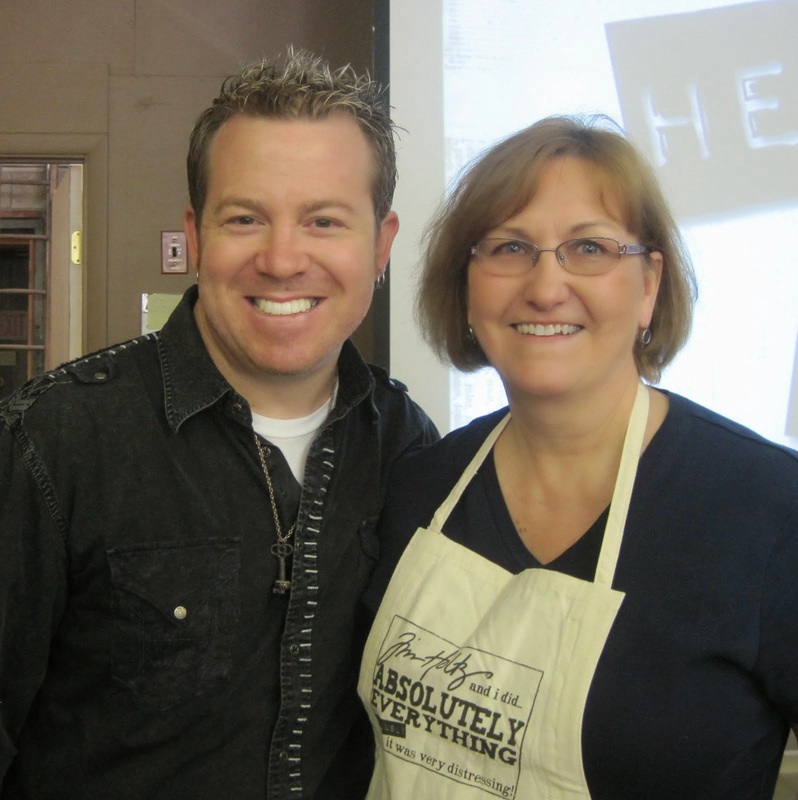 I invited my friend, the wonderfully talented and creative Mona Pendleton to be my Guest Designer. 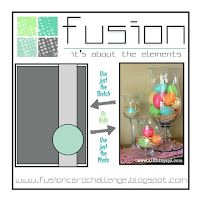 You will find all of the DT and Guest DT inspiration over at the Fusion Blog. Here is the inspiration photo and sketch for January! You can be inspired for your creation by one or both! I was inspired by the photo this month - I loved the shaggy banner and the blackboard design! 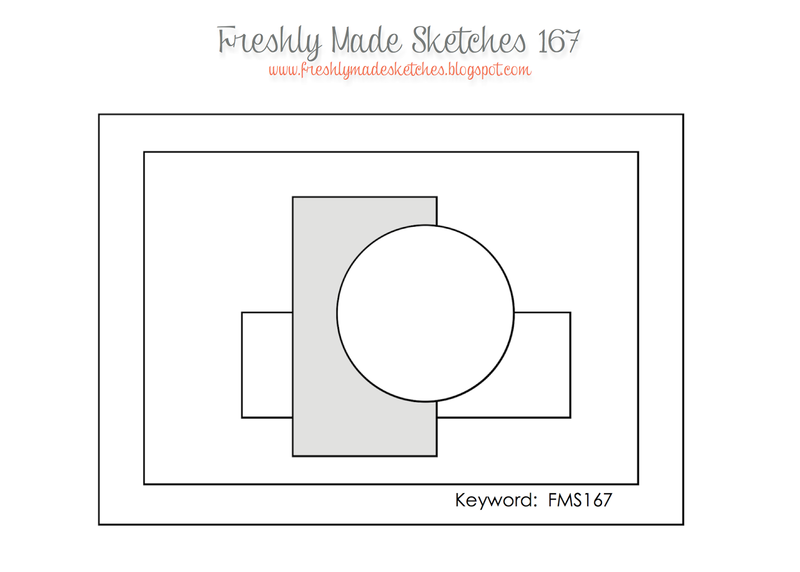 First, I punched out the bottom area using the Stampin'Up Curly Label punch. I embossed the front of the white card using Wendy Vecchi's Archival Tree Branch ink, the Woodgrain Background stamp from Waltzingmouse and Wendy Vecchi's Tree Branch Embossing Powder. Then I sponged over the whole thing with Wendy Vecchi's Archival Potting Soil ink. I cut a panel of black cardstock and white embossed the sentiment, stars and streamers from Cake and Candles by Avery Elle. Then I rubbed some Adirondack Snow Cap ink over the panel to give a chalk dust look using my finger. 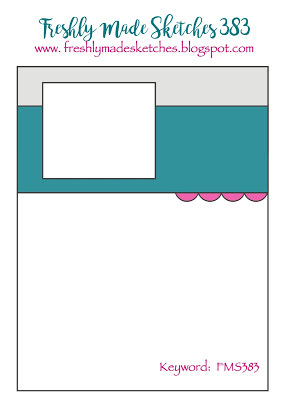 I made the fringe banners by die cutting some tissue paper with the Fringe Border die from Memory Box. I folded the tissue paper over 4 times and die cut it - then cut small pieces, stapled them at the top to hold them together and glued them to a piece of twine. I die cut and embossed the balloon dog from Party Animal from Avery Elle.on Sweet Blush card stock using Frantage Shabby White Embossing powder. I stamped the sentiments on white and punched them with the SU Word Window punch. I added enamel dots to the ends of the streamers. 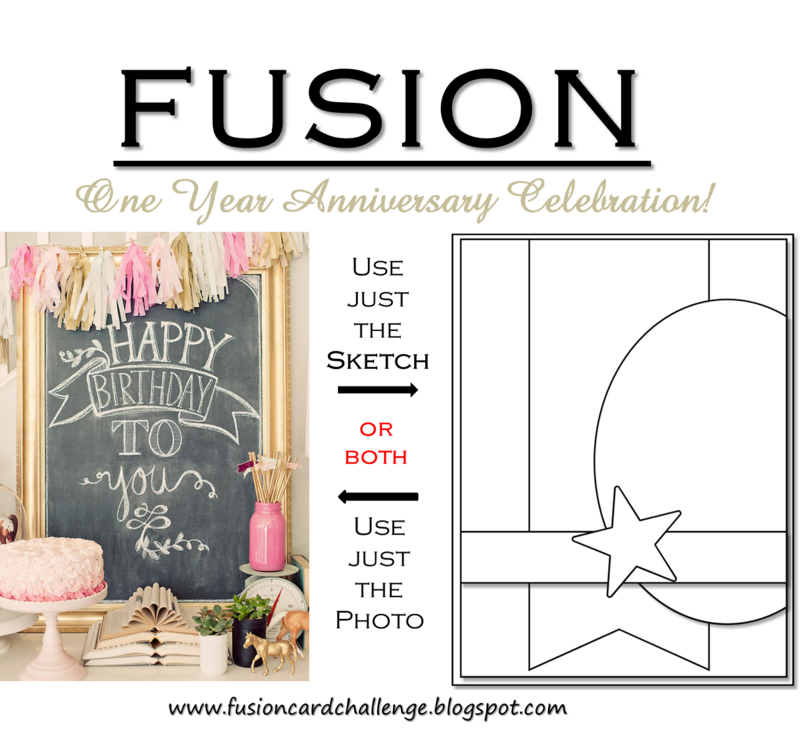 So - we hope you will join us in our One Year Anniversary Celebration by linking your inspired card over at Fusion - where you will find lots of inspiration from the DT and our wonderful Guest Designers as well! I'm also linking this to the Mixed Media Card Challenge - Theme New - Optional Element Tissue Paper. 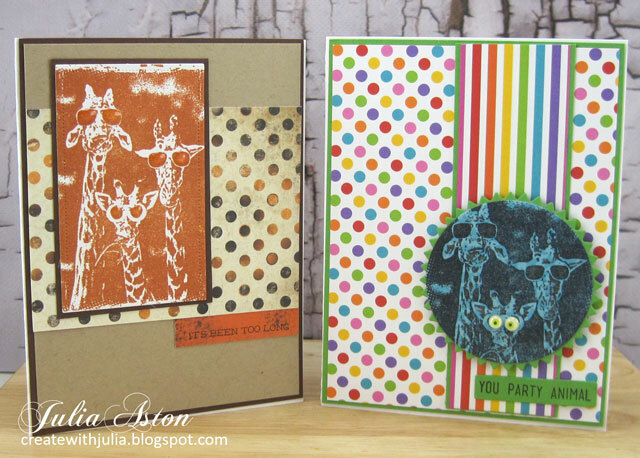 Stamps: Woodgrain Background - Waltzingmouse, Cake & Candles and Party Animal - Avery Elle. Paper: White, True Black, Sweet Blush - PTI, white, aqua and pink tissue paper from stash. Ink: Versamark, Wendy Vecchi Archival Tree Branch and Potting Soil, Adirondack Snowcap Ink. Accessories: Frantage Shabby White Embossing Powder - Stampendous, white embossing powder, Wendy Vecchi Tree Branch Embossing Powder, Fringe Border Die - Memory Box, Party Animal Die - Avery Elle, tiny attacher - Ranger, Scotch Quick Dry Adhesive, Glue N Seal - Ranger, Word Window Punch, Curly Label Punch - Stampin'Up, foam dots, enamel dots - home made from Perler Beeds, Caribbean Twine - the Twinery.